This series is one of my favorites and after reading a lot of mixed reviews—from OMG LOVE IT to OMG HATE IT—I was really concerned when I went to watch it at the theater. I went with two of my best friends who had never read the books and as soon as we stepped out of the theater they both asked me about the books and how soon could they borrow them. Main actors selection. Zoey Deutch is totally Rose. There’s no doubt about it. Lucy Fry nailed Lissa Dragomir. Dominic Sherwood captured the true personality of Christian Ozera. And Danila Kozlovsky convinced me as Dimitri Belikov, even though I still think he's too old. Rose and Dimitri. Can you see the chemistry? Suporting actors selection. Cameron Monaghan was freaking adorable as Mason. Knowing what happens to him later makes it worse. Sarah Hyland as Natalie was the right dosage of nerdy and dorky, and the final transformation was pretty awesome. Friendships. I really loved how they highlighted the dynamic between Rose and Lisa. The minimum angst. Though it’s clear Rose is disappointed at Dimitri’s refusal to initiate anything between them, I was SO glad when she turned everything around and flipped him. The humor. I only laughed out loud a couple of times from really good jokes, while the rest were just like haha. But that still didn't change the fact that I had a huge smile on my face every time Rose was speaking. Headmistress Kurova. My reaction to her character in the movie was basically ‘What. The. Hell.’ Like, why did they make her into an airhead, mean girl, childish woman? I do not remember her like that at all. Yeah, she was always against Rose, but she was never petty about it. In the movie, she is mean on purpose, just out of spite. It was ridiculous. And my critique is to the character, not to the actress because I know Olga Kurylenko is phenomenal. But they took what I remembered to be a pretty serious character and turned her into a silly joke. Shut up. There’s a moment in one of the final scenes where Lissa basically tells Queen Tatiana to shut it, and it was so out of character both for Lissa to do it—because I don't remember her ever challenging authority like that—and for the queen to simply follow along. 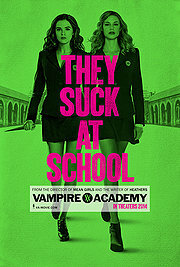 Overall, I think the movie captured the essence of Vampire Academy. I won't be able to tell you how closely it follows the book because I read the series a couple of years ago and my mind is fuzzy on specifics. But it was funny, entertaining, and so much better than anything I expected! Now, can we please get Frostbite? I need me some Adrian Ivashkov on the big screen.